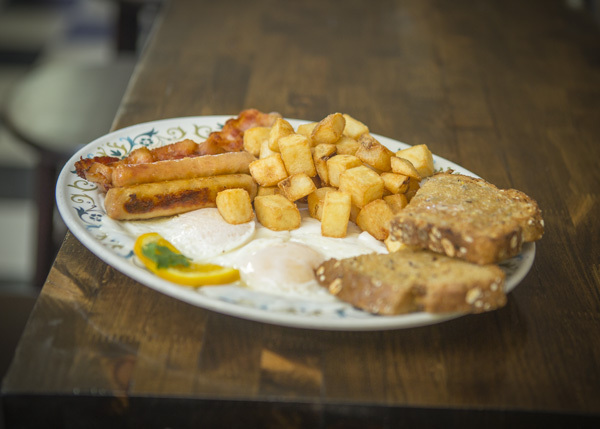 Two eggs cooked your way served with sourdough or multigrain toast and your choice of sausage, bacon or ham. Bacon, ham, sausage and two eggs served with toast and hashbrowns. A little bit of everything: bacon, ham, sausage, one egg, toast and hashbrowns. Two eggs served with bacon, sausage and ham, steak, two slices of multigrain or sourdough toast and hashbrowns. A challenging breakfast. Steak with two eggs cooked your way, served with sourdough or multigrain toast. Two pieces of sourdough bread soaked in a seasoned egg and milk wash and fried. Fried egg with bacon or ham, topped with lettuce, tomato, cheese and mayonnaise. Served on your choice of sourdough or multigrain toast. Ham, pepper and onion mixed with egg, fried and served on multigrain or sourdough toast. 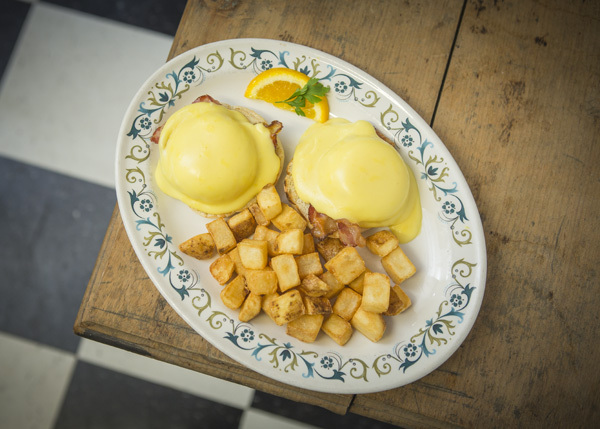 Two poached eggs served on your choice of bacon or ham on a toasted English muffin and topped with hollandaise sauce. An Eggs Benny variation: Two poached eggs served on sliced tomato on a toasted English muffin and topped with hollandaise sauce. An Eggs Benny variation: Two poached eggs served on fried mushrooms on a toasted English muffin and topped with hollandaise sauce. All omelettes are made with two eggs and are served with your choice of sourdough or multigrain toast. Kalamata olives, red onion, tomato, pepper, feta cheese. Peppers, onion, ham and cheese. Onion, tomato, peppers, and mushrooms. Hashbrowns topped with scrambled eggs, bacon, cheddar cheese, mushrooms, onions and peppers. Romaine topped with scrambled eggs, bacon, cheddar cheese, mushrooms, onions and peppers. Served with coleslaw and potato chips. House roasted chicken with lettuce, tomato and red onion, served on sourdough or multigrain bread with house aioli. House roasted beef with lettuce, tomato and red onion, served on sourdough or multigrain bread with house aioli. Bacon, sautéed onion and cheddar cheese served on sourdough or multigrain bread. Shaved ham and swiss cheese with lettuce, tomato and red onion served on sourdough or multigrain bread topped with mustard. Clubhouse inspired sandwich with roasted chicken, bacon, lettuce, tomato and cheddar cheese on multigrain or sourdough bread, topped with mayonnaise. Our soups are homemade and change often. Our soups are gluten free and vegan friendly. Ask your server about the soup of the day. Crisp romaine, crunchy bacon and croutons with a creamy Caesar dressing. 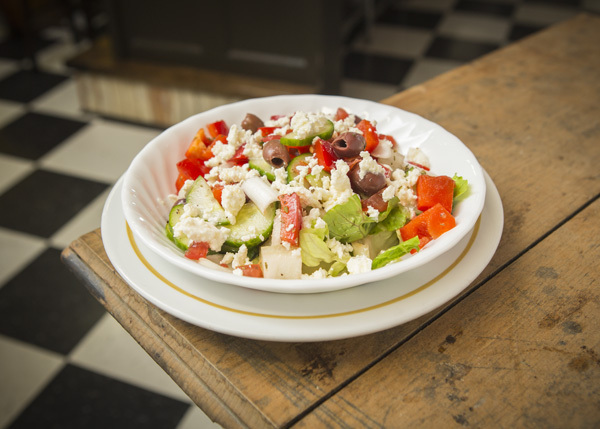 Cucumber, tomato, red onion, peppers, feta cheese and Kalamata olives with house Greek dressing. Romaine lettuce, tomato, cucumber, red onion and diced peppers served with a house vinaigrette. Small Salad and a Small Sandwich. Steak, cooked to your specifications, with fries and sautéed mushrooms and onions. Sliced steak with mushrooms, onions, peppers and cheddar cheese, served on toasted sourdough bread, served with fries. Served with sweet and sour sauce for dippin’. 4oz patty made from 100% certified Angus Beef with cheddar cheese, topped with onion & pickle, ketchup, mustard and relish, on a sesame seed bun. 4oz patty made from 100% certified Angus Beef with sautéed button mushrooms & swiss cheese, topped with aioli and mustard on a sesame seed bun. lettuce, and tomato topped with mayonnaise, on a sesame seed bun. 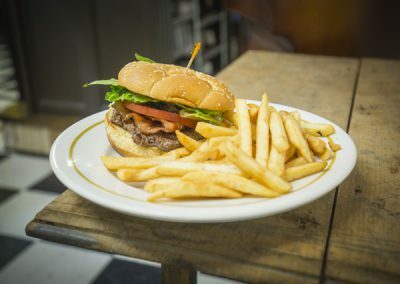 6oz patty made from 100% certified Angus Beef with bacon, lettuce and tomato, topped with mayonnaise, on a sesame seed bun. 6oz patty made from 100% certified Angus Beef loaded with bacon and cheddar, on a sesame seed bun. Breaded chicken tenders with lettuce, tomato, bacon and cheese, topped with mayo, served on a sesame seed bun. 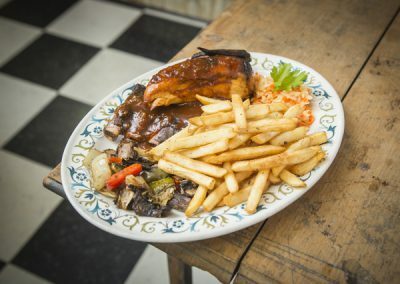 Our Hot Sandwiches are served with sautéed peppers, onions and mushrooms and coleslaw and come with fries. *Substitute for onion rings or a side salad of your choice for $2.00. Slow roasted beef on sourdough bread smothered in gravy. Roasted chicken on sourdough bread smothered in gravy. 100% Certified Angus Beef between two slices of bread smothered in gravy. *Substitute salad or onion rings $2.00. 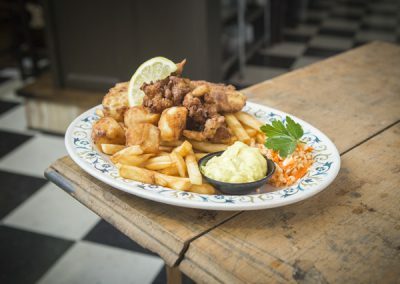 Lightly battered deep fried haddock. Crispy fish served on a bun with tartar sauce and lettuce. 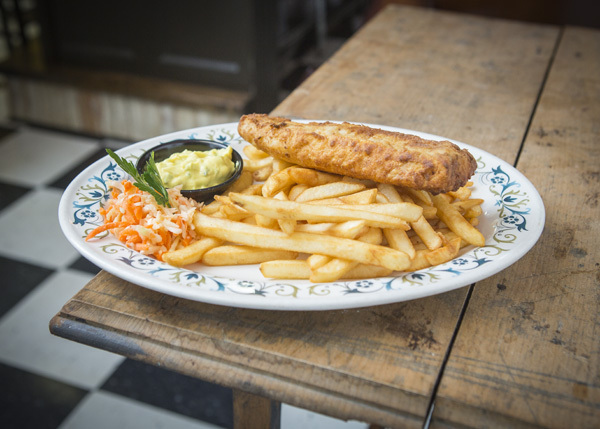 Smaller portions of our classic items available to anyone. A little version of our haddock and fries. Ground beef sautéed with onions, served with fries, gravy, coleslaw and fried vegetables. Mini burger served with a handful of fries. 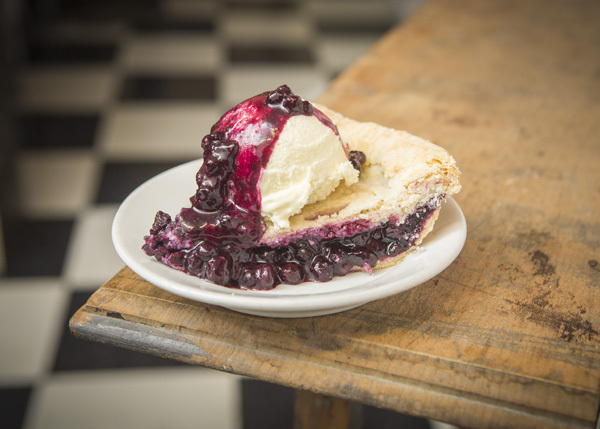 Ask your server or check out our chalk board to see what kind of homemade pie we’re offering today.